This is about the eraliest known version of a digital video game, Spacewar! 2B, which also happens to be the first digital video game publicly shown in a presentation and also the first one to be cited in literature, and it's about providing a carefully revised version that would actually run on the only real hardware preserved, i.e., a PDP-1 with the automatic multiply/divide option. Notably, this project is not affiliated to the Computer History Museum (which homes the only runnable DEC PDP-1) in any way and there are probably just minimal chances to see this program on the real machine. — If nothing else, this project may prove the term "modern hardware" to be somewhat relative. One of the major driving forces for investigating the source code of Spacewar! was, right from the beginning, my ambition to identify the very version of Spacewar! as it was presented at the MIT Science Open House in May 1962 and as described by Martin Graetz in "The Origin of Spacewar" (Creative Computing, August issue 1981; Volume 7, Number 8) and in his DECUS conference paper "Spacewar! Real-Time Capability of the PDP-1" (DECUS Proceedings 1962: Papers and Presentations of the Digital Equipment Computer Users Society; Maynard, Massachusetts, 1962, p. 37-39) . The Origin of Spacewar, Figure 4. Moreover, there is still a patch missing, namely a patch adding matchplay and scoring facillities. (See below.) And, last but not least, there's another technical reason for Spacewar 2B not to be seen on the Computer History Museum's restored PDP-1, the very implementation of the hyperspace trigger: Spacewar 2B's hyperspace triggers rather on the release of both clockwise and counter-clockwise turn (left + right) than on them being deployed at once, like we know it from later versions of Spacewar. The later implementation poses a problem for any installation using rather buttons for turns than a lever or joystick of sorts, since hyperspace may be deployed easily by accident while players are navigating their ships without any intention of actually escaping to hyperspace. Thus, the CHM's control boxes include some ciruitry in order to inhibit those signals, when raised by the navigational buttons and features a dedicated hyperspace button instead. But it's also this circuitry that prohibits the hyperspace trigger from working, when operated rather on the release of the combined signals, as we encounter it in Spacewar 2B. So we want to fix this, too, by inverting the functionality of the trigger to something alike the implementation of Spacewar 3.1. Finally, Spacewar 2B originally just runs a single game and has to be restarted for any new one, something that was fixed by an auto-restart patch. While the logic of this patch is flawless, there is an edge-case, where Spacewar 2B is stuck in an infinite explosion of two colliding ships, still requiring a manual restart. Therefor, as we're going to provide an updated version, we may want to address this, as well, but in a way as non-intrusive as possible to the original code and appearance. There are numerous reasons to attempt a preservation of Spacewar 2B along with its patches: First, it's the earliest full implementation of the first know digital video game. Then, it's also the first digital video game described in literature and we may want to preserve a working functional equivalent of the game as described. Moreover, — apart from minor cosmetical differences to later versions — it doesn't only feature Martin Graetz's Minskytron Hyperspace, but also the original implementation of Peter Samson's Expensive Planetarium, featuring a background starfield moving at variable speeds and also implementing the varying intensities of the star's magnitudes by a different technical approach (compare "Part 1: The 'Expensive Planetarium'"). This episode is about how this updated version of Spacewar 2B is implemented, thus also providing a detailed documentation of the steps and modifications involved. 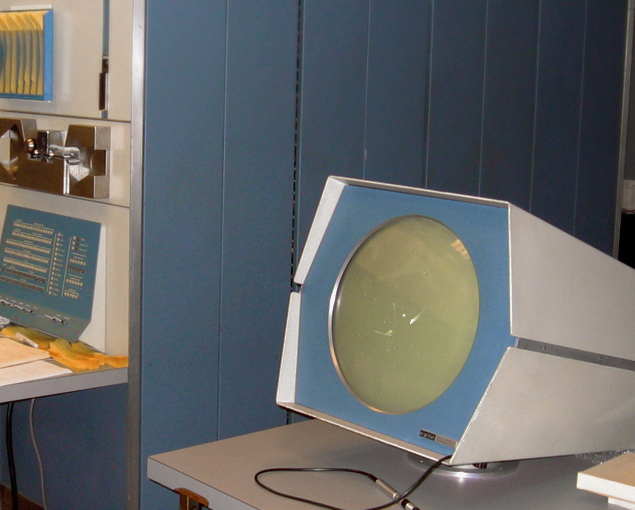 Spacewar 2B as imagined on the CHM's PDP-1. Montage, N. Landsteiner, 2016; Photo of PDP-1 by Tom Bennett (creative commons). As for naming things, we'll christen our revised version "Spacewar! 2B-m", where "m" is for "multiply" or "modified". ▶ See Spacewar! 2B-m running in an in-browser emulation. Let's have a quick glance at the individual parts. Spacewar 2B survived both as an authentic listing and in binary code on paper tape. The listing is part of some collected printouts and notes that were given by Martin Graetz to Brian Silverman in the 1990s (the printout of Spacewar 3.1 was used for the seminal Spacewar emulation in Java by Barry Silverman, Brian Silverman, and Vadim Gerasimov) and later donated by Brian Silverman to the iMusée, the Musée de l'informatique du Quebec. This listing is titled "spacewar 2b 25 mar 62", a transcript of the printout is available at https://www.masswerk.at/spacewar/sources/spacewar_2b_25mar62.txt. The printout also shows some hand-written annotations documenting an earlier attempt to port the game to a PDP-1 with the auto multiply/divide option. The binary tapes are "spacewar2B_2apr62.bin"  and "spaceWar_SA-5.bin" . The code loaded from these paper tapes is identical, but while "spacewar2B_2apr62.bin" loads only the core program, "spaceWar_SA-5.bin" is an all-in-one tape comprises also the starfield data, along with a separate file representing an early attempt at patching the game for a PDP-1 with the automatic multiply/divide option installed. A disassembly of the two tapes shows identical code to the listing of "spacewar 2b 25 mar 62", with the only exception of the sense switch options checked for reverse polarity. (Where "spacewar 2b 25 mar 62" is checking for a switch set to off, the binary versions check the respective on states, just like the later versions of Spacewar.) Thus we may derive a nearly authentic listing of "spacewar 2b 2 apr 62", by adjusting the few instructions used for these checks according to the disassembly. A listing of this revised source code is available at https://www.masswerk.at/spacewar/sources/spacewar_2b_2apr62.txt. This is also the very source we will rely on for this project. Single game operation (restart required for a new game). No table of "interesting and often changed constants", parameters are rather inlined and values for torpedo speed, life, and reload time differ, contibuting to the single major difference in gameplay. Exhaust flames of spaceships are drawn as a short, continuous line (half the size of later versions). Single shots only, no salvoes. The Expensive Planetarium modulates brightnesses by refresh rates only (as opposed to using the intensity of the "dpy" instruction) and features variable speeds. Moreover, the start position is right at the margin of the starfield rather than in the lateral center (as observed in other versions of Spacewar). Explosions are drawn in a well perceptible box (the so-called "crock explosions", compare "The Origin of Spacewar" and source code comments). Moreover, there is no flag indicating a non-collidible state. Thus, an alledgly winning ship may still collide with the debris of an exploding opponent, resulting in a tie. The object table reserves the same number of properties for all collidible objects, while later versions reserve some for the two spaceships only (thus, put in modern terms, subclassing the spaceships). There is a property for the spaceships' fuel supply (same as used in later versions), but the supply is never allocated, nor consumed. Thus, the ships are of infinite fuel supply. Finally, a subtle difference in the implementation of the random number generator. In all other respects, the code is very similar to Spacewar 3.1, which may be said to represent a consolidated an augmented version of Spacewar 2B. This is the same dat as used by all version of Spacewar (with the exception of Spacewar 4.0TS [ddp, 5/4/63], which only uses a reduced subset). 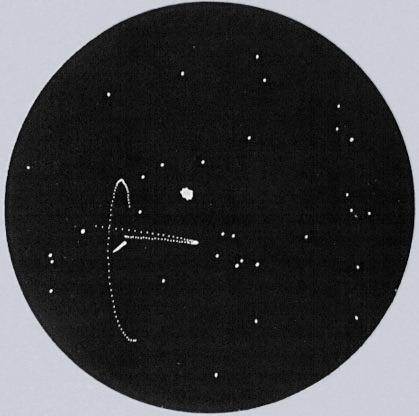 Notably, it was set up by Peter Samson for this very version of Spacewar, 2B, as indicated by it's title, "stars by prs for s/w 2b". The date, "3/13/62", which is the same as the date annotated to the background display code, provides a hint on the timeframe we may attribute to the development of the main program. The original hyperspace patch survived both in binary code  and as a listing included in the collected printouts donnated to the iMusée . The dissassembly of the binary code on paper tape and the listing provide identical code. A transcript of the listing is available at https://www.masswerk.at/spacewar/sources/hyperspace85.txt. The hyperspace patch is applied directly to Spacewar 2B by 4 installing hooks in total (at the entrance of the main loop, inside the code for setting up a game, in the iteration of objects in the main loop, and in the code for decoding any player input). We have already discussed the code in detail previously, see Part 8, Spacewar! 2b and the "Minskytron" Hyperspace. We may assume that the repunch was prepared for use with the PDP-1 of the Computer History Museum, when still the Boston Computer Museum, as part of an attempt to provide a running version for the PDP-1 with the automatic multiply/divide option installed — as documented by the hand-written annotations found in the listing of "spacewar 2b 25 mar 62". (Both the listings of "Hyperspace 85" and "spacewar 2b 25 mar 62" are showing the same hand writing.) In essence, we're here accomplishing what was attempted previously in the Boston context, presumably by Martin Graetz. The auto-restart patch is preserved in digital images of binary paper tapes only, namely in the tape-files "spaceWarRstrt.bin"  and "spacewAutoRestartPatch.bin" . While the information on the two tape images differs on the binary level, both are loading identical code. The source code reconstructed from the disassembly is available at https://www.masswerk.at/spacewar/sources/spacewAutoRestartPatch.txt. Notably, the auto-restart patch hooks into the hyperspace patch, thus requiring the hyperspace patch already in memory. We've discussed the code in detail previously, see Part 8, The Auto-Restart Patch. All collidable objects explode on coming into critical range. The current rules require that a game is won only if the remaining ship (after the opponent has exploded) can successfully avoid being blown up by any torpedos which may be left over. A tie is declared: when both ships collide (and explode); when an apparent victor is destroyed by a loose torpedo; or when both ships run out of torpedos. Russell eventually wrote a subroutine that would keep score, displaying in octal (everyone could sight-read that base-eight number system by then) the total of games won. was written by Steve Russell, just as the code we find in Spacewar 3.1. Thus, the scorer patch must have been functionally identical or very similar to the scoring facility in Spacewar 3.1 and was written by the same author. Also, we already observed that Spacewar 3.1 was rather a consolidated version of Spacewar 2B and its various patches. Thus, we may attempt to provide a suitable reconstruction by referring to the source code of Spacewar 3.1. As scoring and matchplay requires some kind of auto-restart functionality, the scorer patch either required the auto-restart patch (probably by installing a hook at its exit) or provided some restart code of its own. Since the restart conditions are a bit different for Spacewar 2B and Spacewar 3.1 (version 3.1 implements the object handler with an is-collidible flag stored in the sign-bit, while Spacewar 2B does not), we will assume the former, keeping as much of the original code as possible. Finally, we want to fix the problem with the hyperspace trigger and the control boxes found at the CHM. This may be obtained simply by reversing the logic of the trigger to something alike the approach we see in Spacewar 3.1, thus still closely related to the original code. Since all the patches include hard-coded addresses, we may want to start with inlining the patches. We will do this by inlining most of the code that is directly hooking into the main program and putting the core logic of the patch at the end, thus referring to the inclusion of the Spacewar 4.8 scorer patch into Spacewar 4.1/4.2 by Peter Samson as best practice. The hyperspace patch uses the same symbols as Spacewar 2B, but all of them are assigned directly by the patch, while some of them are rather defined as assembler varibles in the main program. Since the PDP-1 Macro assembler determines the type of a symbol on its first occurence, the difference in notation (an assmbler variable is denoted by an upper stroke in one of the characters, or in the modern C-implementation by a leading back-slash) doesn't matter and we may keep the original code essentially unchanged. sr7,	dap . / length of torp calc. hp1,	isp . /(th1)OK to jum? sza i			// is it not zero? sza i			// any left? As pointed out previously, the check for the spaceships' handler addresses being reset to zero at the end of any explosions misses an edge-case, where two motionless objects (the two spaceships) keep colliding infinitely. Now, we could either install an is-collidible falg (as it was done in Spacewar 3.1) to resolve this issue or we may even attempt to modify the entire collision detection. But none of these approaches do recommend themselves for the preservation of the original program as they would also come with a few side effects on the overal behavior of the game. sas mtb			// is control word of first spaceship the same? sas mtb 1		// is control word of second spaceship the same? law mtb				// spaceship 1 alive? law mtb 1			// spaceship 2 alive? lac \gct			// check match count, is it the last game? lac \1sc			// is it a draw? The only difference here to Spacewar 3.1 is in referring rather to "mtb" and "mtb 1" than to "ss1" and "ss2" in order to keep the context of the auto-restart patch. Also, just like the auto-restart patch, we're just checking them for being set to zero (compare the code iof the restart patch). Moreover, we strip an erroneous clearing of flag 2 and are prefixing all the labels by "sa" in order to prohibit any collisions with existing labels. Now, that we've a fully functional version of Spacewar 2B that can be proven to behave identical to the program loaded from the original tapes (apart from the recoded hyperspace trigger and the modifications applied to auto-restart patch), we may address an upgrade to the automatic hardware multiply/divide option. As we'll see, this turns out to be much simpler than what we may expect based on previous investigations of earlier attempts to accomplish this. /calling sequence= number in AC, jda sin or jda cos.
/argument is between ±2 pi, with binary point to right of bit 3. /answer has binary point to right of bit 0. Time = 2.35-? ms.
/argument is between .+2 pi, with binary point to right of bit 3. /answer has binary point to right of bit 0. Time = 2.35 ms.
/Call. lac one factor, jda mpy or imp, lac other factor. //Call. lac one factor, imp, lac other factor. /returns quot in ac, rem in io. idv,	0				/integer divide, dividend in ac. dvd,	0				// essentially eqivalent to instr. "div"
Notably, we accounted for all calls to the BBN-subroutines and may strip them from the code, just like it was done in Spacewar 4.0. The whole point of hardware multiplication and division is a significant gain in speed — but for our very purpose this comes quite unwhished for, since we want to preserve the original experience. There are various ways to cope with that: Spacewar has a count-up loop to spend any excess runtime, and we could just increase this cycle count as it has been done in Spacewar 4. But the only part affected by the upgrade is the spaceship routine, so this will result in side effects on frames where just a single spaceship is drawn (like the hyperspace animation) or none at all (like with explosions of colliding ships). Or we may want to increase the runtime count of the spaceship routine that is subtracted each frame from the total count for the purpose of this count-up. But this cycle count is also used to determine the size and timing of explosions and we would have to change other parts of the code as well. By this we've successfully finished our port of Spacewar 2B. ▶ Run Spacewar! 2B-m in the browser.